As I think back now, there are only really two places in the old Church High building I never got to visit: down in the Boiler Room and up on the roof. Both were the domains of the ‘guys’. I’m not so bothered about the former, but the latter remains a persistent niggle. Why didn’t I think to ask to go ‘up on the roof’ to tick that box as I said my goodbyes in that sad but sunny summer of 2014? 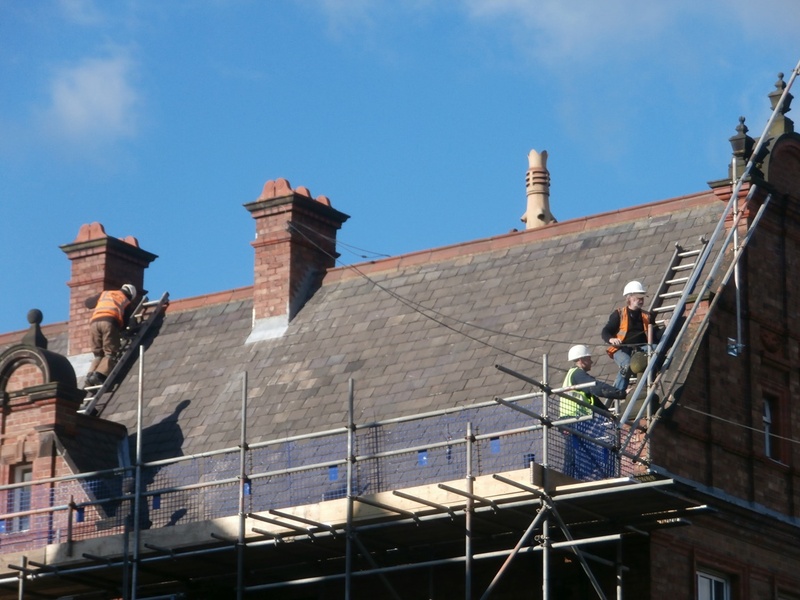 Seeing the red brick ridge-tiles against the bright blue sky today as I photographed the roofers in action, that niggle returned once again. The striking gable-end roofline architecture looks fantastic against the bright blue sky. I’ve already said there was 10 weeks’ work to do up on the roof. Not surprising really. 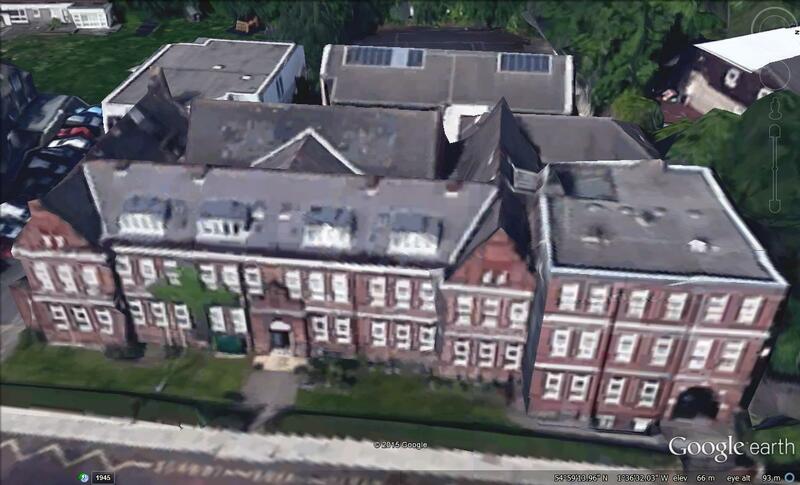 There’s an awful lot of roof up there, of all sorts of shapes and sizes, as these aerial images from Google Earth show. 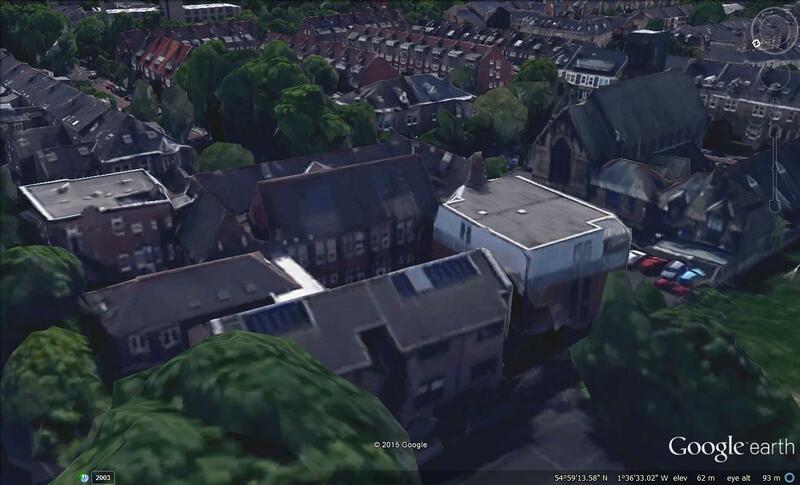 Google Earth 3D aerial images showing the varied Church High roofline both from the front perspective and the back. 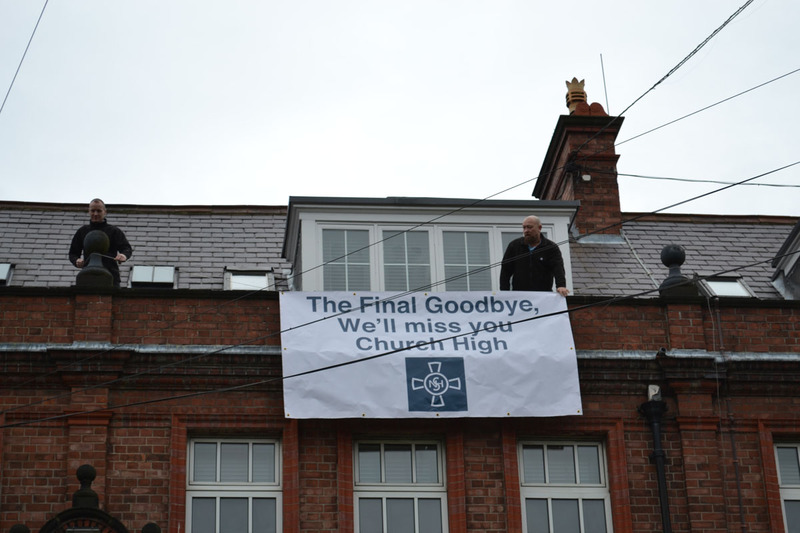 For most folk, I guess the roof will always be synonymous with the Leavers’ Days when at about 6.00 am the Site Team would gamely hang out the traditional, lovingly-prepared banners. The last guys to perform this ritual were Vince Milner & Craig Brauns in May 2014. 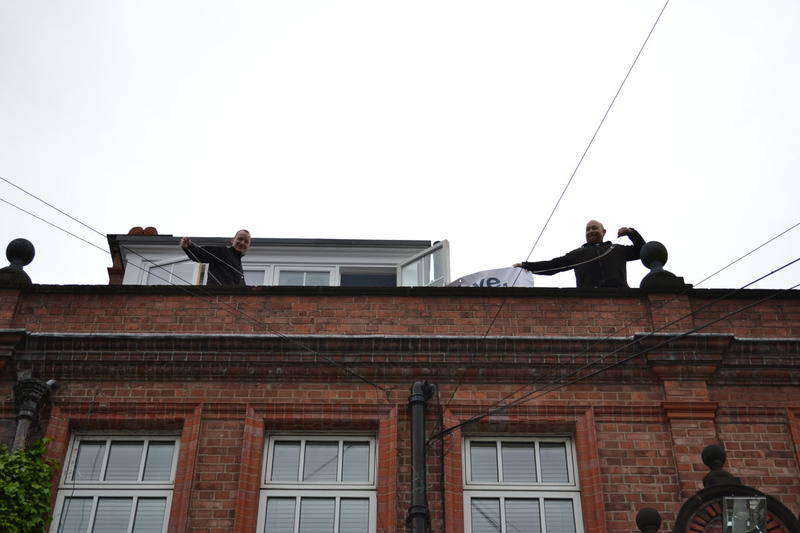 Vince & Craig ‘up on the roof’ on Year 11 Leavers’ Day, 2014. 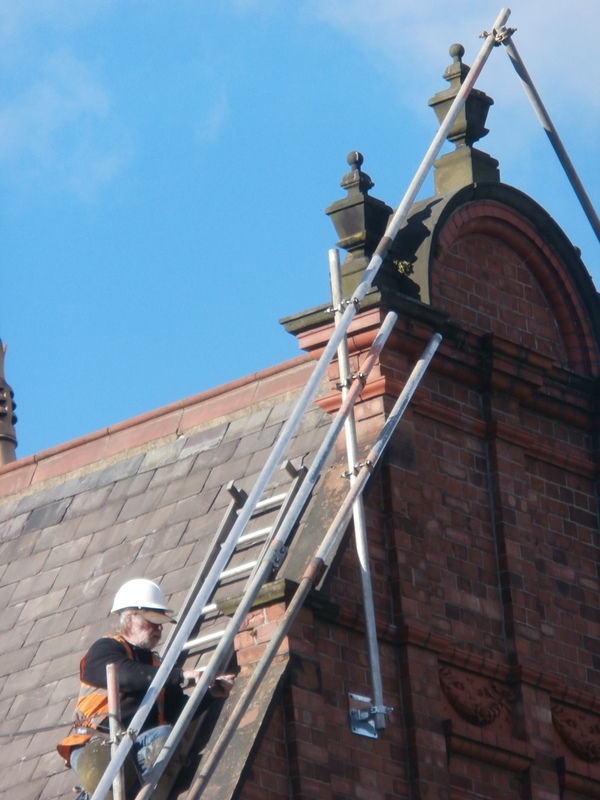 However, I know some folk will also have very different memories of the Church High roof. On more than one occasion, I remember girls abseiling off it while fundraising for The Duke of Edinburgh Award. 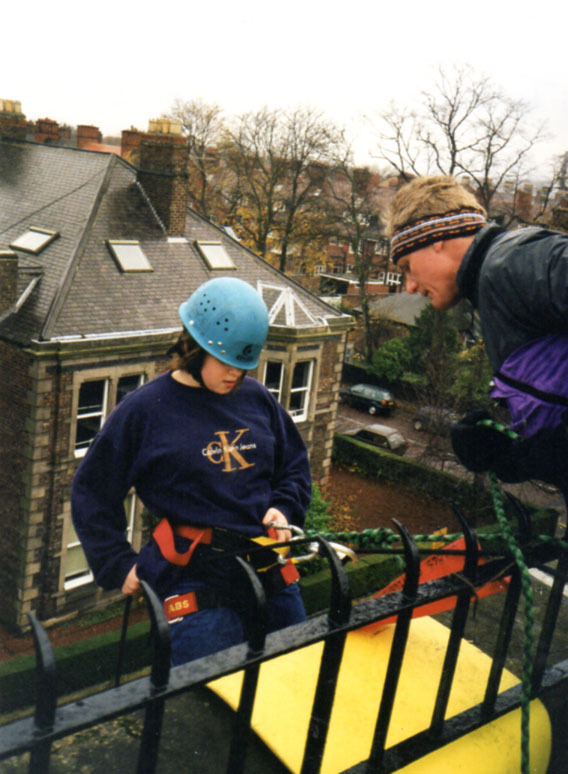 The D of E Award Abseil, November 1998. In today’s Health & Safety age, the work underway at the moment seems to require protective fencing to be fitted all around the roof. I assume this process has all been factored into the 10 weeks’ work. 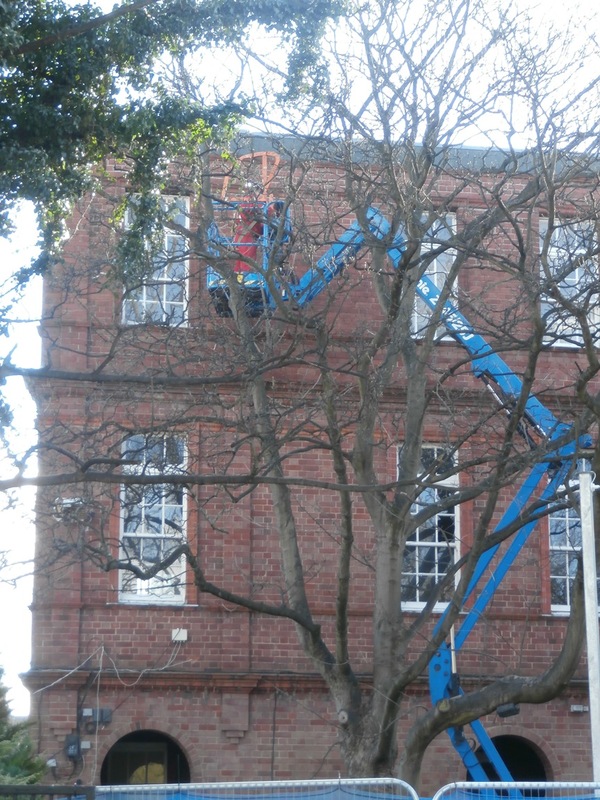 A man in a blue cherry-picker I thought was doing pointing on the north face of the main building, I was told was fitting a safety fence. This is how the roof safety fences were fitted. 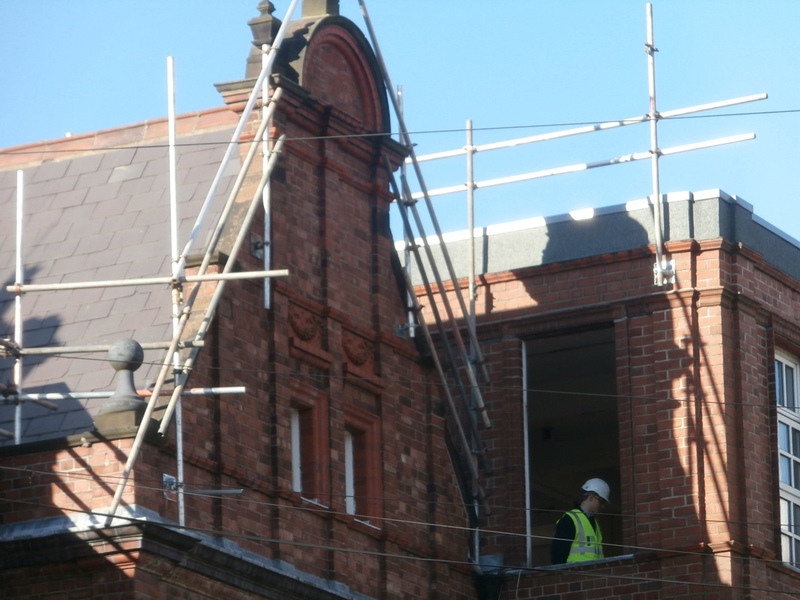 The sections already fixed into place certainly provide passers-by below with a very different view of the familiar red-gabled roofline. 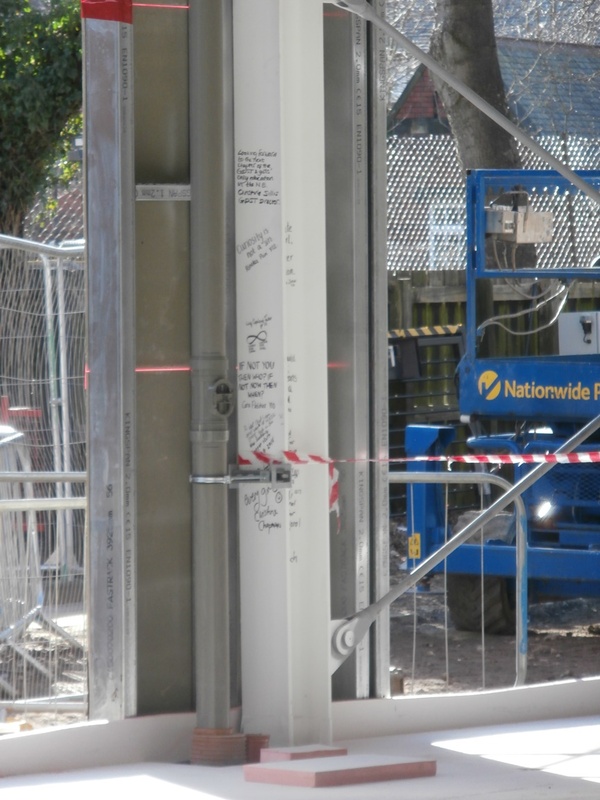 The safety fencing already in place now frames the front of the building: workman framed in an empty ICT Suite window. Although this wasn’t the main focus of activity there today, Wates workers were clearly up on the roof of the new-build structure too. More safety fencing & workers on the roof of the new-build. Bearing in mind I was only in the new-build the day before for the ‘Topping Out’ ceremony, I was curious to see how much change, if any, would be obvious in just 24 hours. But with 80 men working on the site now, it wasn’t really a surprise that things had moved on. It had been clear from inside the structure that black plastic sheeting was being rolled out across the floor. 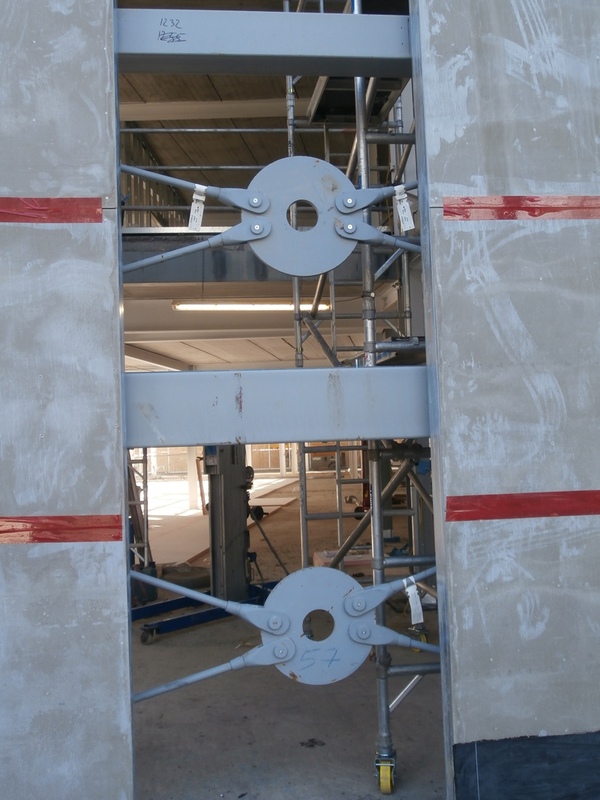 Today, the gaps between the concrete-board offered glimpses of further activity going on within. 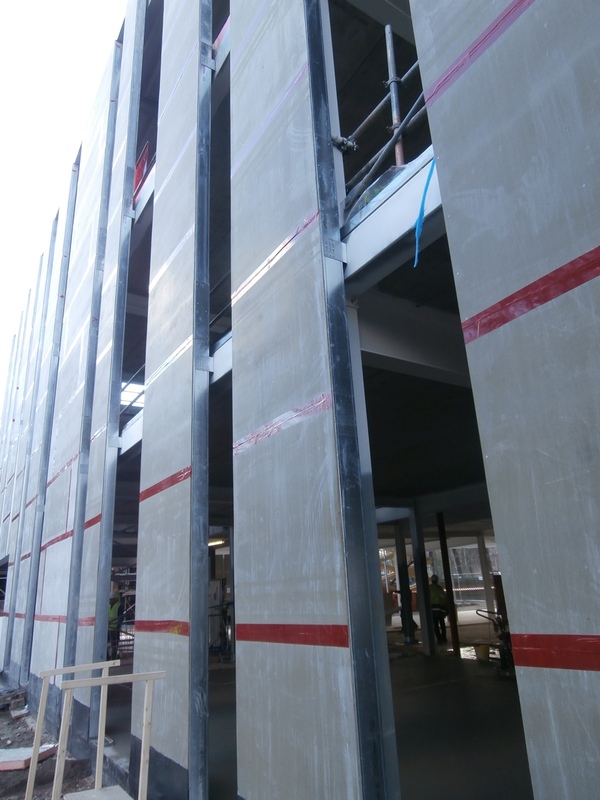 The concrete boarding is dramatic up close. 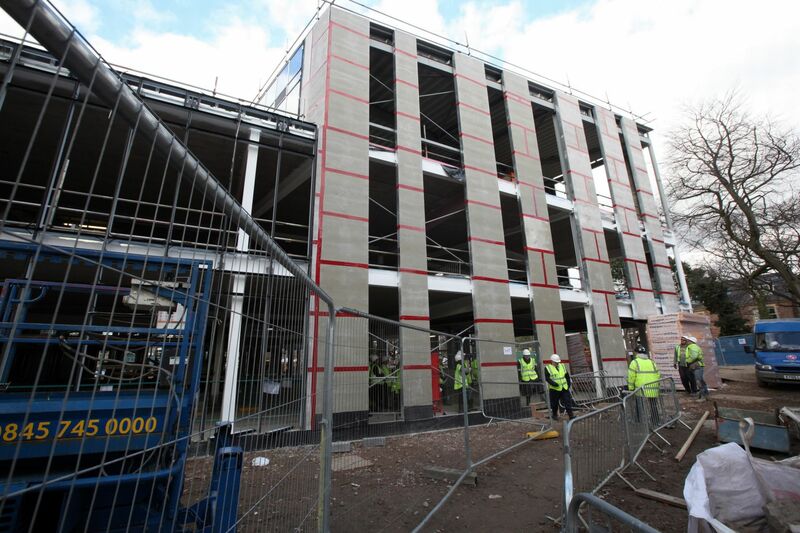 Clear progress had been made on the ground floor of the new-build. Where black plastic was being laid yesterday, wet cement was being applied and expertly levelled-out today. 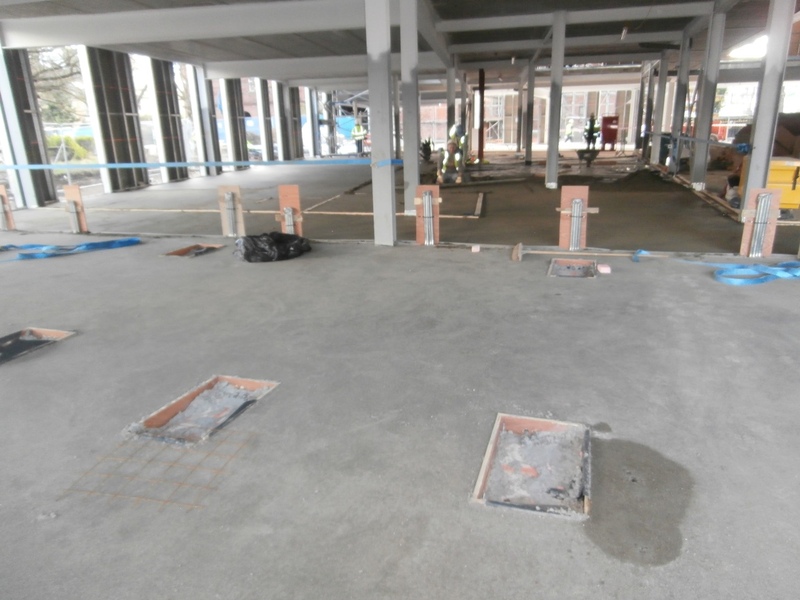 From the floor of the north-side, it was now even possible to see where the machines of the new Fitness Suite are going to be positioned. And the south-side, where the ‘Topping Out’ ceremony took place, was all now a sea of white. ‘Time stands still for no man’ clearly. What a difference a day makes. 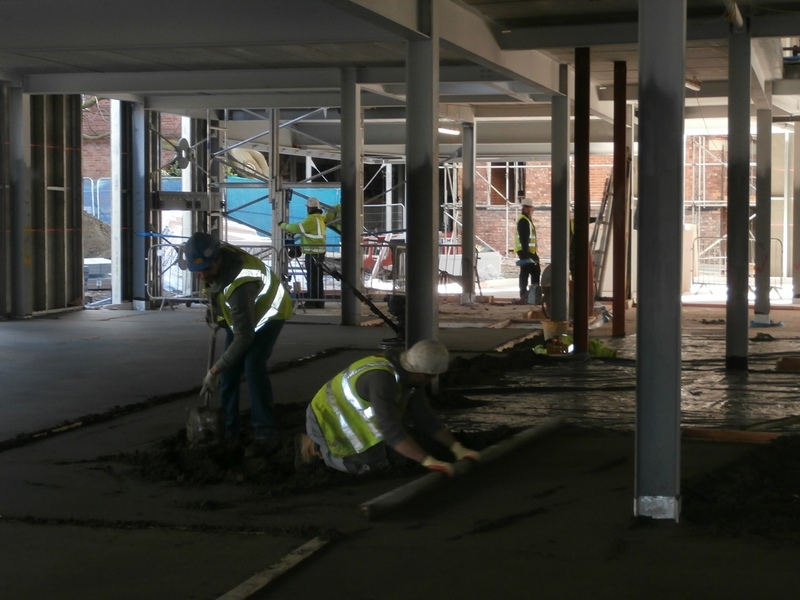 Wet concrete being levelled for the floor of the new-build. On the north side, the floor of the Fitness Suite is now set. 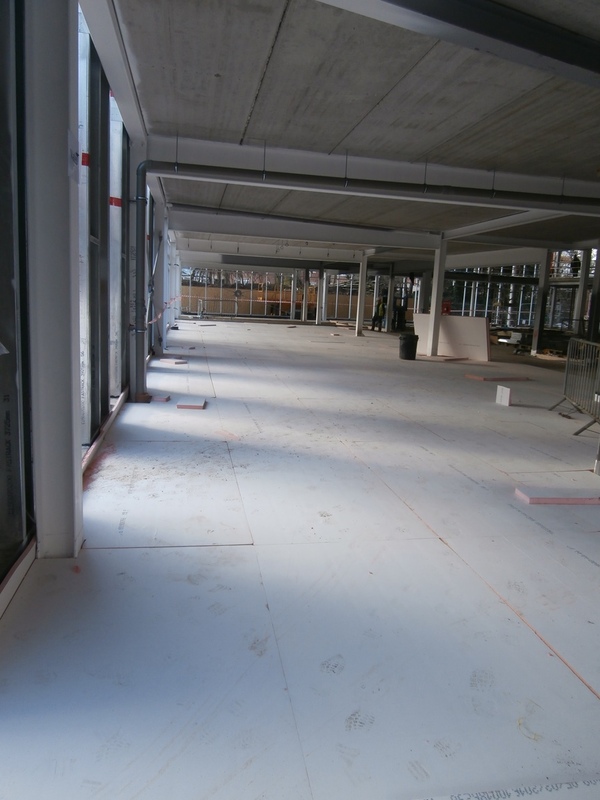 Where yesterday’s ‘Topping Out’ ceremony took place, the floor is now a sea of white. The clear evidence that ‘Time stands still for no man’. What a difference a day makes! 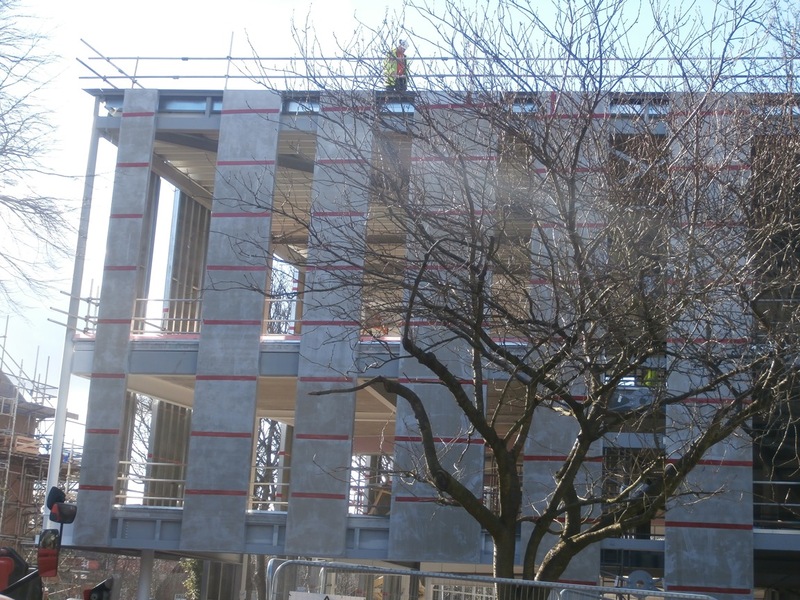 Wates Construction: ‘Topping Out’ on Tankerville Terrace. Wikipedia really is a mine of information, isn’t it? If you haven’t already looked the title phrase up, let me save you the bother: ‘In building construction ‘Topping Out’ (sometimes referred to as ‘Topping Off’) is a builder’s rite traditionally held when the last beam (or its equivalent) is placed atop a structure during its construction. Nowadays the ceremony is often parlayed into a media event for public relations purposes. After topping out, numerous elements of construction remain, including interior finish and most mechanical, electrical, and plumbing systems.’ So there you go! And, of course, this was the exact stage of construction reached at Tankerville by February 23rd. A Tuesday. 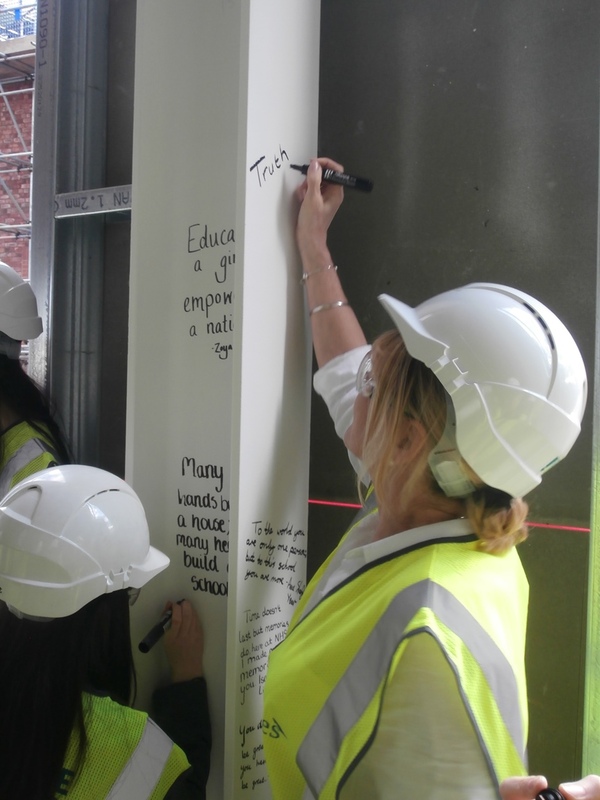 The simple ‘Topping Out’ ceremony inside the new-build. I love the history behind the simple ceremony we joined with Wates Construction to perform that day within the ‘New Girl.’ The practice of ‘topping out’ can apparently be traced to an ancient Scandinavian religious rite of placing a tree atop a new building to appease the tree-dwelling spirits displaced in its construction. A tree or leafy branch was placed on the topmost wood or iron beam, often with flags and streamers tied to it. We didn’t do this, but I would have liked to have seen it. Very, very fitting for ever green Tankerville. 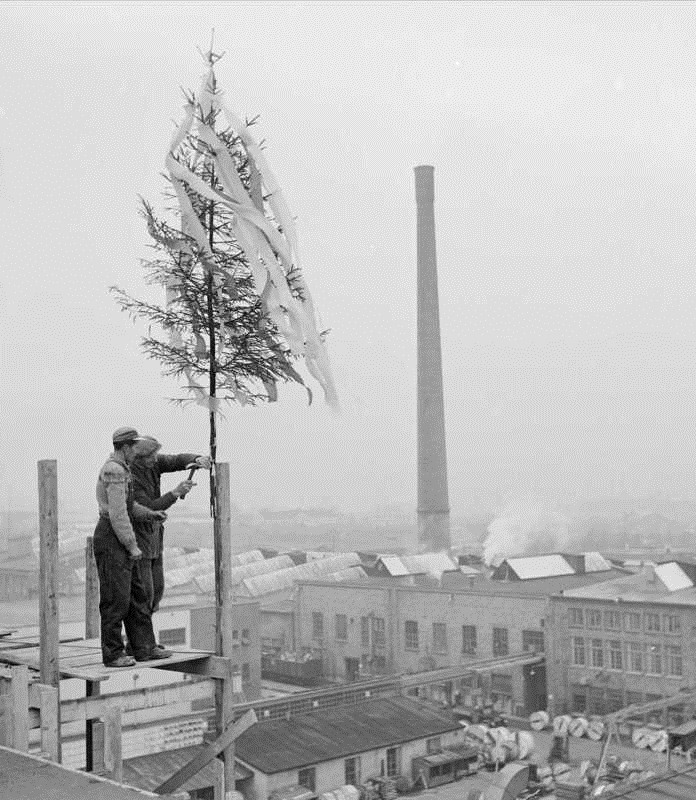 ‘Topping Out’ ceremony in Norway, Kranselag 1959. Wikipedia also tells us that a toast is usually drunk and sometimes workers are even treated to a meal. In masonry construction, the rite celebrates the bedding of the last block or brick. Obviously, this isn’t possible with a modern steel structure like ours. But it was back in 1889 when the beautiful red-brick ‘Old Girl’ was being built. 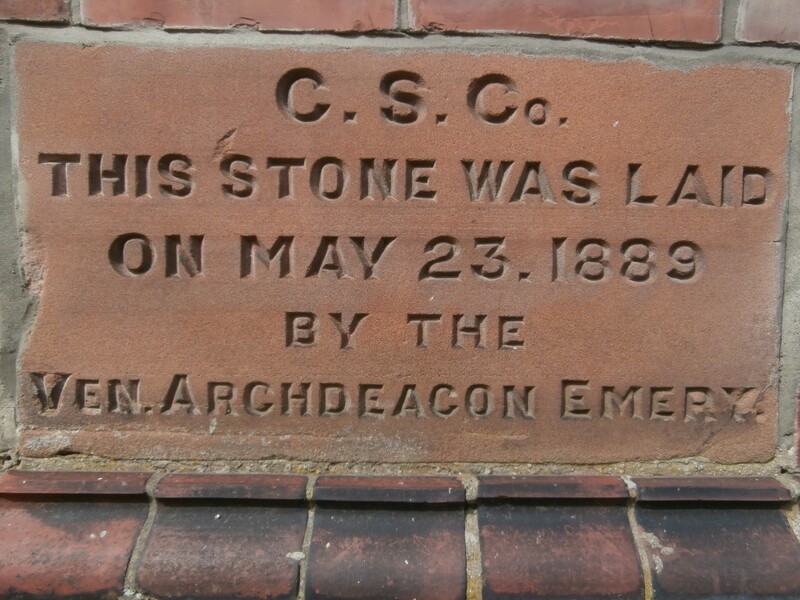 The 1889 Newcastle High School building dedication stone. 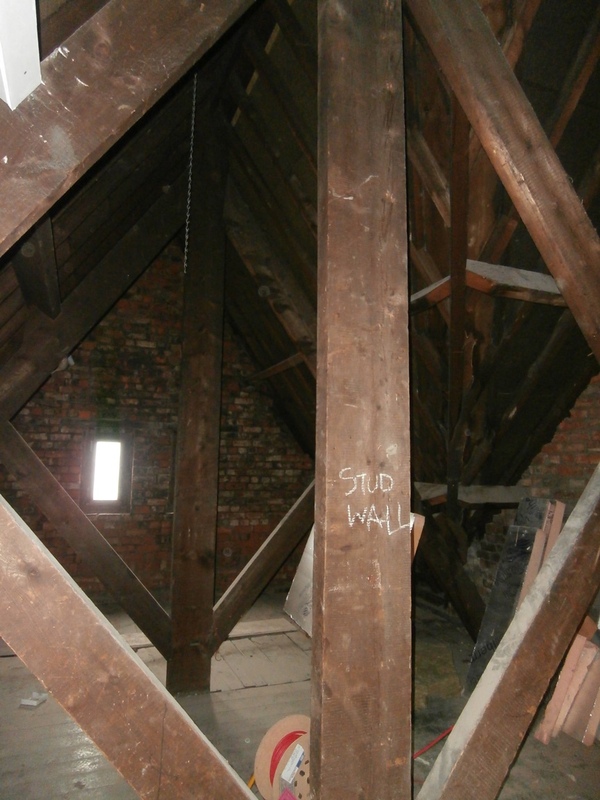 Unlikely to be the very first ones, nonetheless original roof couples in the north wing attic. 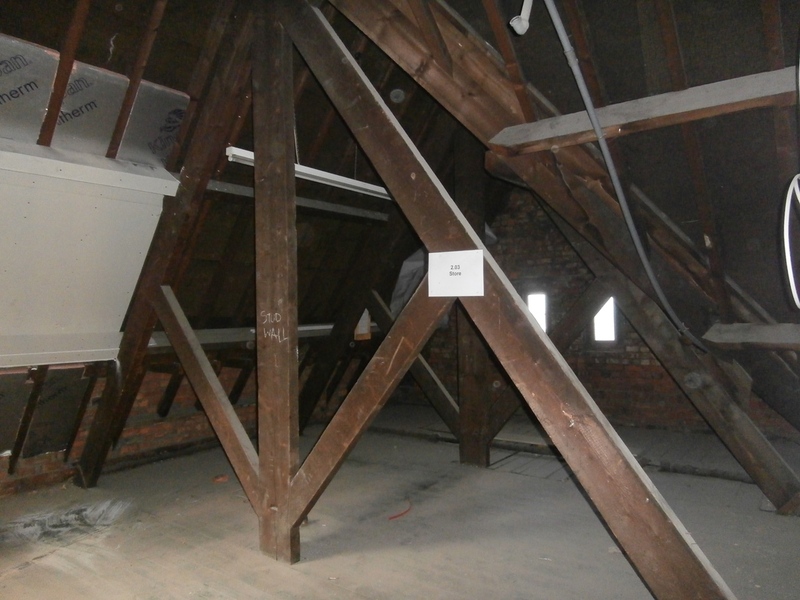 This space at the very top of the north stairs was used for storage and, latterly, by Steven Farrell, IT Manager, as the safest location for the IT servers. King post trusses & hipped roofing to the right. Luckily for us, not only was there my camera to record events for posterity that day, there was also a lady reporter from The Evening Chronicle and photographers from the Chronicle and Wates too. For our ‘Topping Out’ ceremony, as per Wikipedia’s definition, was also partly planned as a media event for public relations purposes. 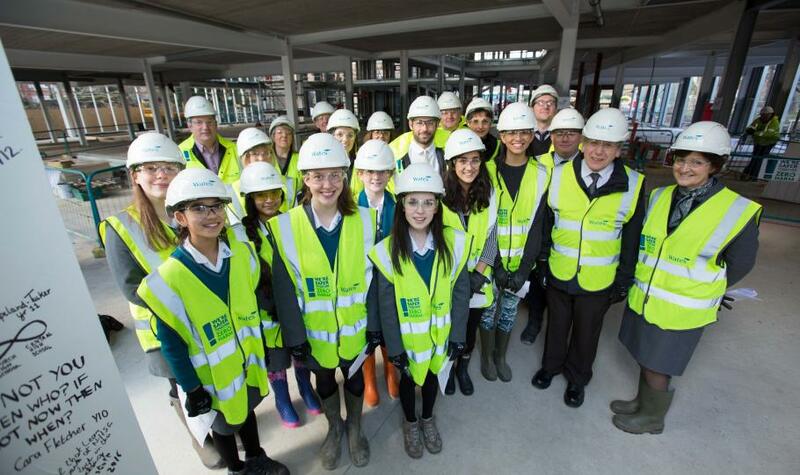 Publicity images of the ‘Topping Out’ ceremony: it seems that I’m the only person not yet wearing my glasses (above)- oops! The initial idea for our metal structure was to have a pupil screwing in the very last bolt, but, in the end, something much more creative involving the whole school was decided upon. 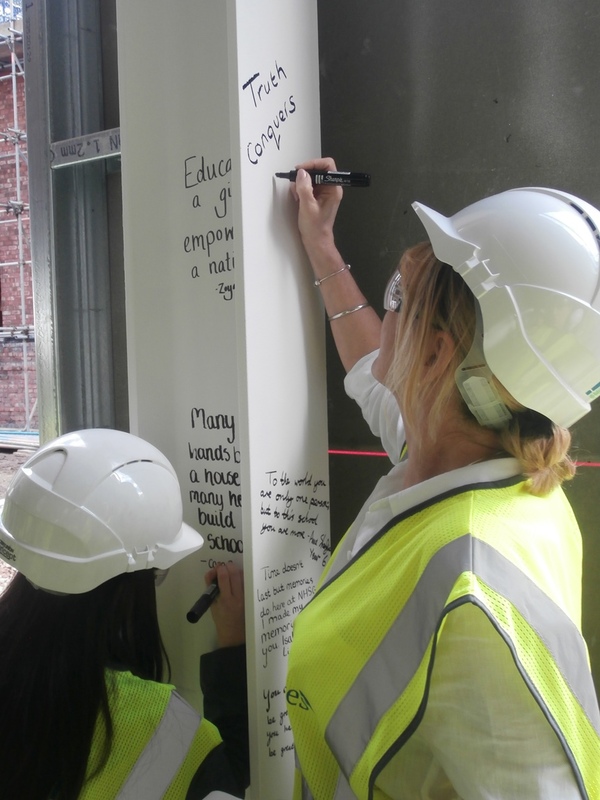 Janice Graves, NHSG Marketing Manager, dreamed up the novel idea of every year group from Year 6 upwards choosing a quotation or saying which their Forum Rep would write for them on a steel beam painted white especially for the occasion. As Head of Year 9, I was really proud of my year group for the message they voted for which was written on the beam for us by Cara Blight: ‘Many hands build a house; many hearts build a school.’ This same honour was also bestowed on Jim Heaton, our retiring caretaker, representing the support staff and on two members of the teaching staff who are also ‘Old Girls’ (Helen Harrison, Church High, and Julie Bowman, Central High) representing the Alumnae. Wates were of course represented by Nick White, Project Manager. 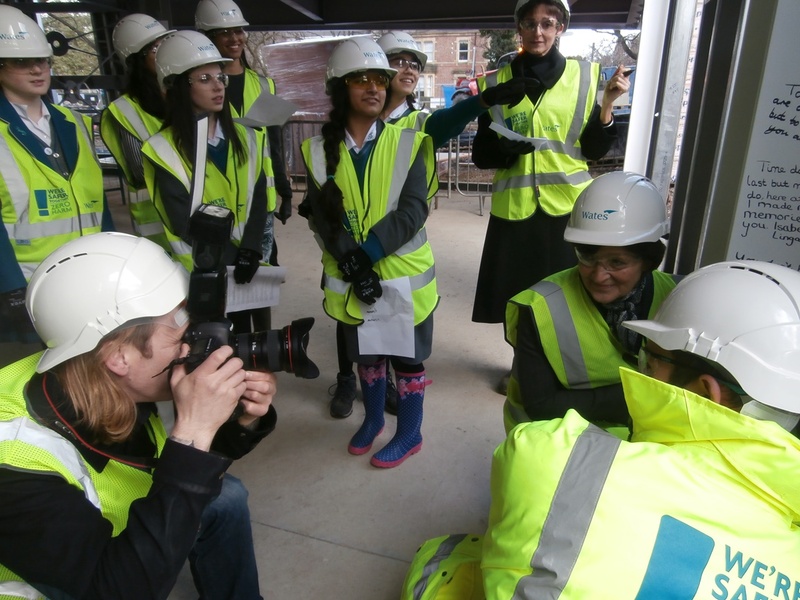 Our ‘Topping Out’ party, plus Evening Chronicle reporter Hannah Graham and two photographers, all met up in the Wates’ Site Office Meeting Room in Westward House to put on our PPE kit. Church High ‘Old Girl’, Helen Harrison, signs on behalf of all the Church High Alumnae. Was there ever any doubt what she’d write? So how did I end up being there, do I hear you say? Because I asked if I could. 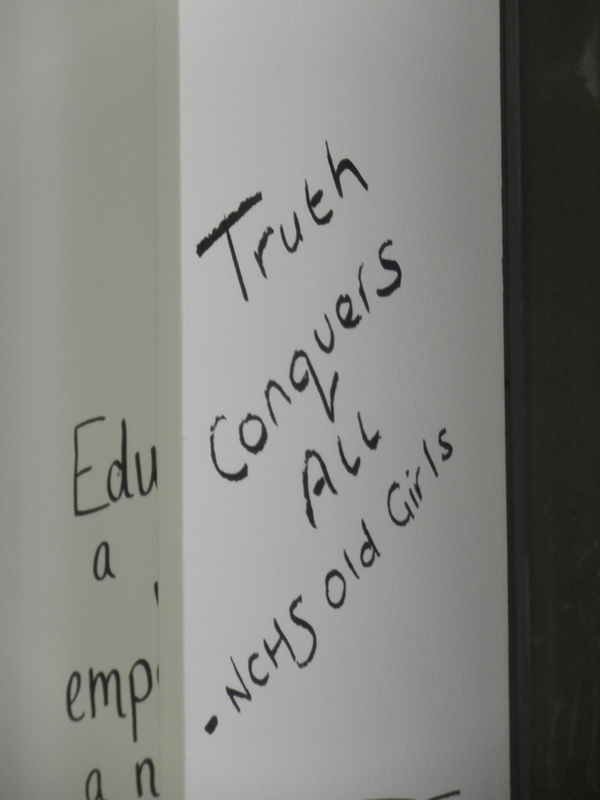 I learned well from ex-colleague, Helen McLean, whose favourite saying I always remember being ‘Shy bairns get nowt!’ Seriously, it was a kindness on Hilary French’s part for which I was very, very grateful – both personally and also because of this blog. 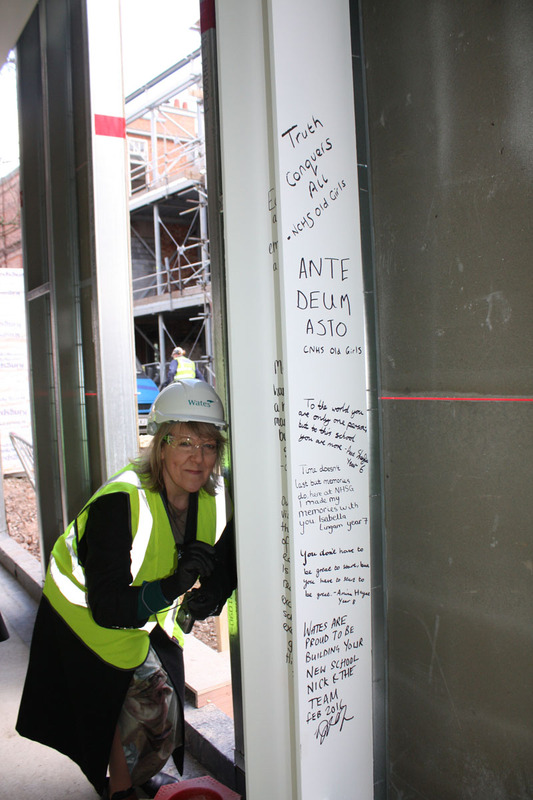 Just being there on such an historic occasion was a thrill in itself, but the offer extended to me by Christine Sills, one of the architects, to write a message on the beam myself was just the cherry on the cake. 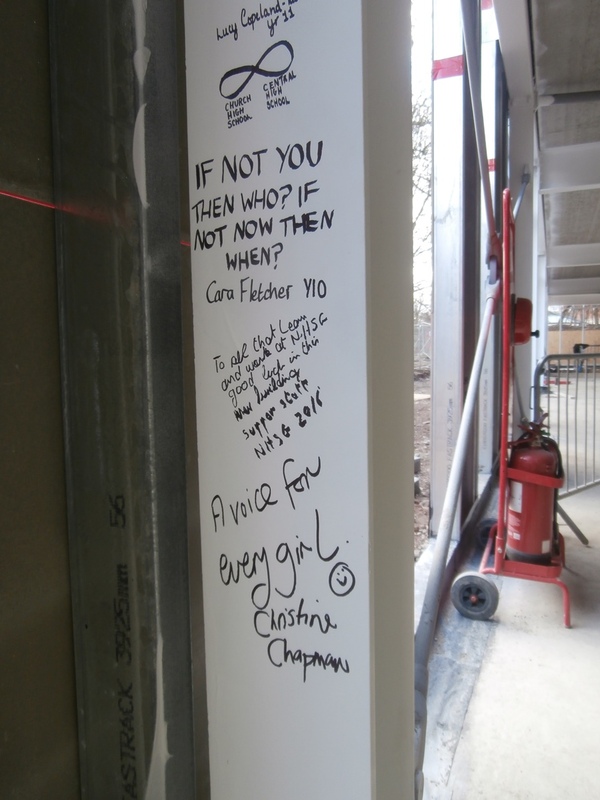 I felt so honoured to be asked by the architect to write on the beam too. I had to think on my feet as to what to write, but after so long editing the school magazine, there really was only one thing I wanted to say. 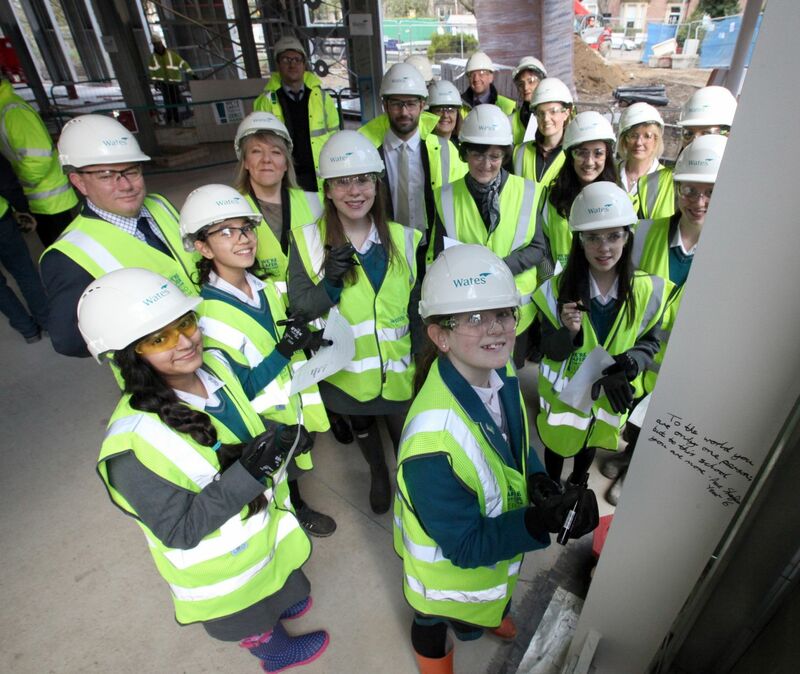 The beam will eventually be enclosed within the wall cladding but it is intended that a plaque will mark the site of it for posterity. For both partner schools, I know it now feels that a little bit of our respective histories are etched forever into the new school structure. And as memories go, this one ‘topped off’ the day just beautifully. 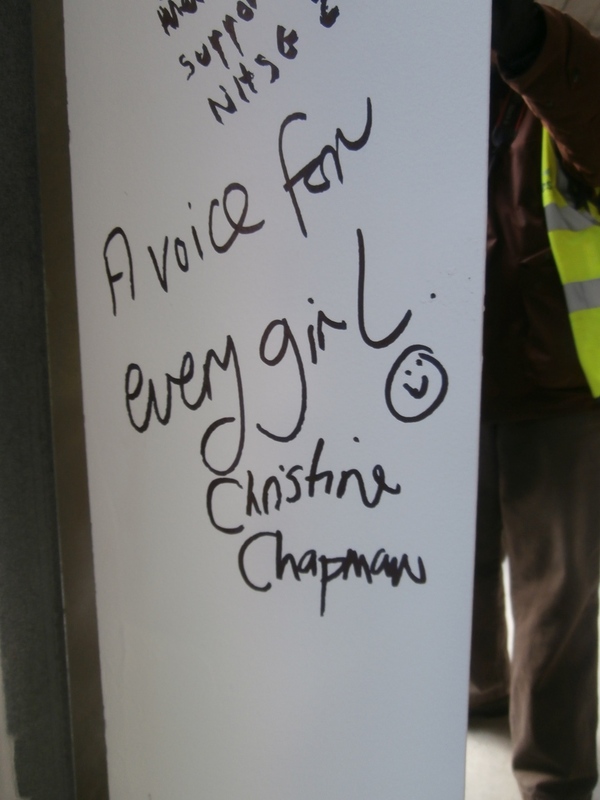 Commemorative messages now in situ forever. Ours was a small party, as Wates’ PPE kit supply is not limitless. But, hopefully, everyone watching this video can now feel part of it too.